When I was a kid I always hated that question “What’s your favorite book?” How the heck am I supposed to pick? In middle school it was The Lord of the Ringsby J.R.R. Tolkien. In high school I loved The Dark Tower by Stephen King. In college, it was the Brontë sisters. But as I get older, I tend to find an author I like and read their entire body of work at once, over the course of a year. Here are some of those authors that I’ve been obsessing over lately. The Paper Menagerie by Ken Liu: This book is a collection of short stories by a speculative writer who is also a translator. What I love about this book is how Liu teaches the reader to read his work and to understand his characters on an emotional level. Liu is a writer’s writer and I’ve learned so much from his work about nuance, structure, and voice. Gutshot by Amelia Gray: A collection of flash fiction and short story pieces that is truly a gutshot. This book is so raw it almost hurts to read, but in a good way, like when you tear away a hangnail that’s been niggling you. Gray’s phrasing and lyrical style is radical and wild and oh so good. Milk and Honeyby Rupi Kaur: Kaur’s poetry has been circulating Instagram for a long time now, but it’s totally worth picking up her books to feel her words on the page. What I love about Kaur is how she pairs image and text in an accessible way that redefines what we call contemporary poetry. If you’re curious about new poetic forms but don’t consider yourself a poetry reader, this book is perfect for you. Holly Lyn Walrath and I will be appearing together at Comicpalooza 2018. We will be among the writers speaking on the panel Writing About Violence Effectively in Speculative Fiction at 3 pm on Saturday, May 26th at the George R. Brown Convention Center. We will also be reading at the Spec Fic writers’ open mic that night, which Holly & Spider Road Press consultant J.T. Haven will be hosting. Hope to see you there! PS: I also highly recommend The Paper Menagerie. 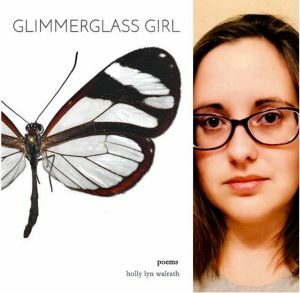 Holly Lyn Walrath’s poetry and short fiction has appeared in Strange Horizons, Fireside Fiction, Luna Station Quarterly, Liminality, and elsewhere. Her chapbook of words and images, Glimmerglass Girl, is available to pre-order from Finishing Line Press. She holds a B.A. in English from The University of Texas and a Master’s in Creative Writing from the University of Denver. She is a freelance editor and host of The Weird Circular, an e-newsletter for writers containing submission calls and writing prompts. You can find her canoeing the bayou in Seabrook, Texas, on Twitter @HollyLynWalrath, or at www.hlwalrath.com. Posted in books and tagged author interview, book reviews, books, flash fiction, poetry.